At least 30 people were killed and over 100 went missing in China when rain-triggered natural disasters wreaked havoc across the country since Sunday, even as authorities on Thursday issued a national early disaster warning for the arrival of Typhoon Soulik. 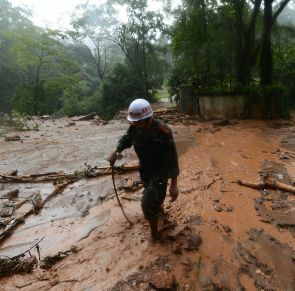 Floods and landslides caused by the downpours have affected about 3.73 million people in 17 provincial-level regions, as well as forced the relocation of 212,000 residents, the Ministry of Civil Affairs said on Thursday. Thirty people were killed and over 100 others remain missing in heavy floods and landslides triggered by rain storms since Sunday, the official media reported in Beijing. The rainstorms also destroyed more than 8,400 houses and damaged another 113,000, causing direct economic losses of 8.56 billion yuan (around $ 1.4 billion), according to the ministry. Meanwhile, the death toll from a landslide in southwest China's SichuanProvince has risen to 18 after six more bodies were retrieved, local authorities said. So far the rescuers had found 18 bodies from the landslide that took place yesterday in the village of Sanxi in DujiangyanCity, state-run Xinhua news agency reported. An initial investigation showed that 107 people across the city were missing or cannot immediately be reached. Local authorities are continuing to verify the exact number of those missing. Search and rescue work is underway. The landslide, which had buried 11 homes in the region, is believed to have been triggered by severe rainstorms since Monday evening. The affected area of the landslide is two-Km long, with about 1.5 million cubic meters of mud, rock and debris, said Qiao Jianping, a researcher with the Institute of Mountain and Environment under the ChineseAcademy of Sciences. The National Commission for Disaster Reduction and the Ministry of Civil Affairs issued the alert at 3 pm, as Soulik is expected to approach Taiwan's east coast early Friday and affect waters off the mainland's coastal provinces. The alert came as the NationalMeteorologicalCenter continues to maintain its orange alert for Typhoon Soulik, the second-highest level on its four-tier typhoon warning system. Soulik is moving toward sea waters east of Taiwan at 20 km per hour, and is expected to hit or pass the waters off Taiwan early Saturday morning, the NMC said. It is then expected to head towards waters off the Chinese mainland's coastal provinces of Zhejiang and Fujian. Influenced by Soulik, the southeastern part of the East China Sea will experience scale 8-10 winds today. In view of this, the NMC has called warned ships to return to port. As the government moved machinery to step up relief work, Chinese Premier Li Keqiang and other leaders have ordered authorities to prioritise lifesaving efforts while conducting rescue work and warned of severe action against them if they fail in their duty. In a written instruction, Li and other senior officials asked relevant departments in disaster-affected regions to enhance monitoring, issue early warnings and watch weather conditions closely. To minimise losses, precautionary measures should be taken to prevent secondary disasters and ensure the security of dikes and reservoirs, Li said. "Under major disastrous weather conditions and threats, schools should suspend classes, factories should suspend production and events involving large numbers of people should be cancelled," a government circular said. The State Cabinet also warned officials that they will be strictly dealt with if they are found to be negligent, incapable of doing their duty or if their poor management results in serious consequences. Image: A firefighter walks across the floodwaters amid heavy rainfalls after a rain-triggered landslide hits Zhongxing county of Dujiangyan, Sichuan province.